BRUSSELS, Belgium – The emerging Alabama bioscience sector is getting a close-up look in Belgium as part of a trade mission that aims to create opportunities for business connections, research partnerships, and new investment. Over the past two days, Alabama bioscience company leaders have displayed their products during presentations and joined with state economic development officials to network with Belgian counterparts and to learn how the life science industry has taken shape in Belgium. 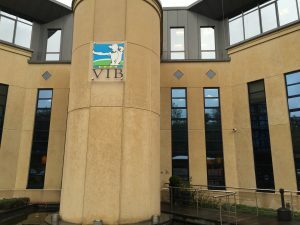 The Alabama group visited VIB, a research organization and incubator, during the trade mission. Tuesday, the Alabama delegation received an in-depth look at bioscience activities in Belgium, highlighted by a visit to VIB, a non-profit research institute in Flanders that serves as the foundation of an innovation and commercialization ecosystem. The group also toured the VIB incubator, where spin-off company Ablynx is focusing on a new class of antibody-derived therapeutic proteins as possible treatments for life-threatening diseases. Hilda Lockhart, the director of the Alabama Department of Commerce’s International Trade Division, said the Alabama delegation is exploring ways to tap into the potential of Belgium’s life sciences sector, which receives strong government support. Dr. Terry Bray, executive vice president of business development for Birmingham’s Atherotech Diagnostics Lab, said the Alabama group also visited UCB, which has transformed itself from a chemical firm to a global biopharma company focused on discovering treatments for severe diseases. Bray said the group heard a presentation from Frederic Druck of BioWin, a bioscience-focused organization that links companies, research organizations, universities, and other stakeholders in the Wallonia region of Belgium. 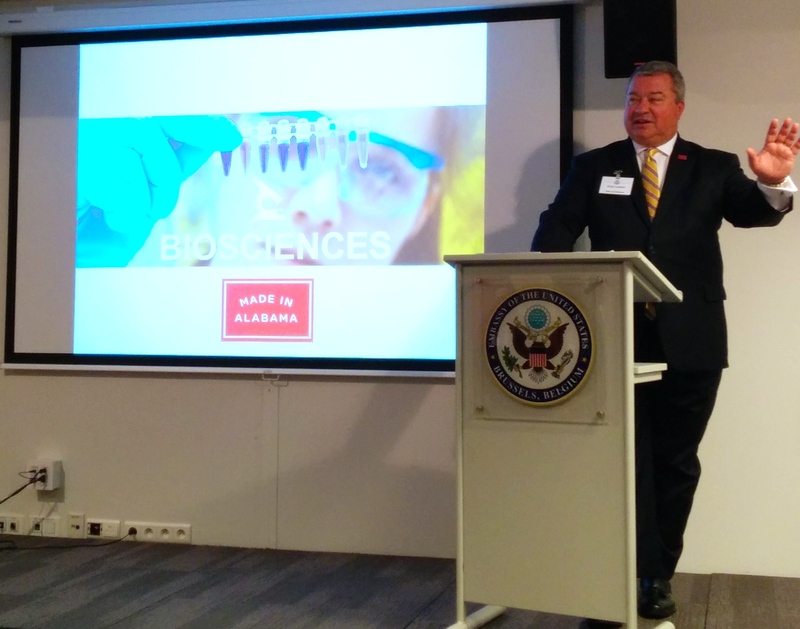 Commerce Secretary Greg Canfield makes a presentation on Alabama biosciences sector on the first day of a trade mission to Belgium. On Monday, the Alabama group led by Commerce Secretary Greg Canfield met with U.S. Ambassador Denise Bauer at the Embassy in Brussels. As a ceremonial gift, Secretary Canfield gave Ambassador Bauer an ink pen crafted by an Alabama artisan from a dogwood tree downed by a tornado. She gave him a box of Belgian chocolates. Steven Ceulemans, vice president of innovation and technology for the Birmingham Business Alliance, said more than 100 executives from the Belgian biosciences industry attended Monday presentations by Alabama firms and a networking reception. Also on Monday, Secretary Canfield presented an overview of Alabama’s bioscience sector, which today numbers more than 550 firms. “The best conclusion overheard from today’s events is that both Alabama and Belgium ‘punch above their weights’ in the life sciences sector,” Ceulemans said Monday. Dr. Patrick Hymel, chief executive officer and co-founder of Birmingham’s MedSnap LLC, said the mission has benefited the start-up in a number of ways. “MedSnap’s participation in the Alabama bioscience trade mission has provided insight into the pharmaceutical and life sciences industry in Belgium and contacts with industry leaders, potential partners and customers in the EU,” Hymel said. 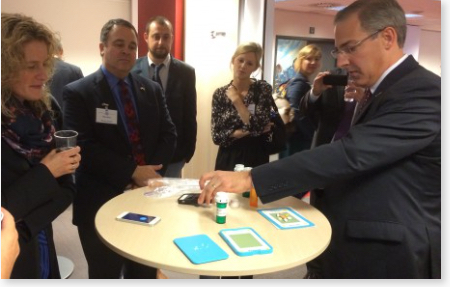 “In addition to site visits to innovative companies and research organizations, we were welcomed at the U.S. Embassy to present our organization to potential customers and partners. We then socialized with the U.S. Ambassador at a private reception. “Overall the experience has provided excellent insight into opportunities for MedSnap to expand to the EU, and was well worth the time and resources to participate,” Hymel added. The focus of the trade mission shifts Wednesday to The Netherlands, where the Alabama team will receive briefings, meet with Dutch bioscience representatives, and tour a major life sciences research cluster. The group returns home Friday. This entry was posted in Uncategorized on October 22, 2014 by medadmin.